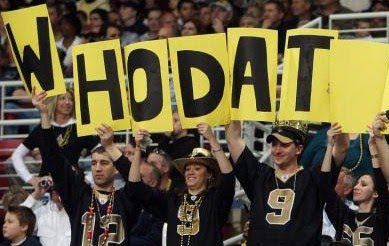 The Super Bowl is soon, and for the life of me I simply can't figure out who dat is! I'm going to put those thoughts on the back burner for now, and start thinking about where I'm going to watch the game. I'll come to your place to watch the game if you'd like me to. Send me an e-mail or post a comment to my blog. I might even bring over a tasty pumpkin pie for us to devour. I sure do love pumpkin pie. Let's get back to the topic: The game. Now, who's playing this year? I don't really care about that, because as you know the Chargers unfortunately won't be there this year. Maybe next year. However, I found a really nice shirt I might purchase for the big game. I have to let you in on a secret. I'm really only watching for the commercials. They should be especially good this year. I think Peyton Manning might dominate the commercials. That's probably a good thing. Peyton Manning seems like a really nice person. Where are we watching the game? If I don't hear from you, I'll probably find a sports bar in the Houston area. What's the best public place in Houston to watch the game? I saw Big Ben! I took a ride on a boat! You all should have been there with me! I had a great morning. I saw Trafalgar Square, this place is fantastic. There were these lions sitting on perches. You have to see this. Remember the big wheel I was going to get on and ride to the top? Apparently that is closed a couple weeks of the year for maintenance, and I happen to be here one of those weeks. No problem, though, I took a boat tour down the Thames River, and saw all kinds of sites. Old buildings, mostly. But they are really nice buildings. Tower of London. It kinda looks like a miniature castle, right on the river. Bought a sandwich for lunch nearby, and a cup of coffee at this place called Starbucks. Had a good time. Of course I saw Big Ben. There are a lot of people wandering around down there. Many of them appear to be tourists. There's a lot to see right in that general vicinity. You can catch a boat tour right there in that area, which I recommend. Many thanks to the person that commented on my blog and suggested I do that. One of the things that is fascinating to me about London is the history here. You'll hear a tour guide talk about a building or landmark that's hundreds of years old, and you realize how young the United States is in comparison. The people here seem friendly and helpful. They're just like Americans, they just talk a little different and drive on the wrong side of the road. And it seems like they all wear dark clothes. I think everyone in this city owns a long, black coat. It's like a uniform item. This was a very successful morning/early afternoon by my standards. Glad I came over to visit! A couple other items of note: Last night, the fire alarm went off at my hotel, causing every guest and a huge party being held here to evacuate to across the street. A fire truck came blaring down the street, and firemen ran in the hotel. I don't think there was a fire, though. So, where exactly is Manchester? These were the words that came out of my mouth yesterday around 7 a.m., when those of us on my airplane flying over the Atlantic were told by the captain that London Gatwick had been shut down due to snow. Heathrow, we were informed, wasn't much better, with at least one plane bound for that airport sent to Amsterdam to land. We were being sent to Manchester. No problem, I thought. Part of the fun is getting there. I wasn't running late for anything, so a diversion to another city really didn't seem a problem to me. However, how bad would the snow have to be to shut down a London airport and deny us landing at another? After sitting on the tarmac in Manchester for roughly 3 1/2 hours (unable to get off the plane because we'd all have to go through customs), we were told that the Gatwick airport would not reopen in time to get us there, and we were waiting on word on how we would finally get to London. So, where exactly is Manchester? Hours north of London Gatwick by bus. To make a very long story short, at 7 p.m. all of us from that plane were still on board several buses tasked with getting us and our luggage to London. Once finally arriving at the airport in London and retrieving my baggage, I got a crash course in London's underground trains from a couple of other helpful passengers, finally finding my hotel around 9 p.m. last night. So, my first full day here was spent delirious from lack of sleep on buses and trains. However, these were nice buses and trains, and I did enjoy getting to see the English countryside on the drive to London. So, anyway, I'm finally here. Looking forward to getting out in the next three or four days to see the place. You all take good care of yourselves, and I'll chat with you later. I searched on Google and found a long list of must-see places in London. However, one London travel writer sets apart 10 sites that she feels are the most important for visitors. I think I'm going to use this list as a basic guide. I'm really excited about my visit this month. I want to go all the way to the top of that wheel, and look around. I want to knock on the front door of Buckingham Palace and see if the Queen wants to have tea with me. On second thought, maybe I won't do that. I want to see the place, though. Houses of Parliament? Of course, I've got to see Big Ben. And how could I possibly miss one of the city's most iconic areas? I'll most likely visit Trafalgar Square. I won't feed any birds there, though. I board the first airplane in about a week. I hope each of my readers is on that plane as well. We usually have quite a good time flying. The sites on that list should keep me somewhat busy during the daytime. Where should I go at night? Maybe you live in London or have visited and can help me with this. I don't mind visiting "trendy" nightspots, but quite frankly, I'm most comfortable and happy in certain types of places. For example, if I was to hear The Bolshoi, The Smiths, Depeche Mode and Nine Inch Nails played in one evening, where would I be? If something like that exists in London, I'll definitely visit. I'll most likely blog or tweet from over there, so you can keep an eye here for updates.